Mr. Market seems to have gotten a bit ahead of himself. The stock price of Wessanen dropped 26% yesterday, but the stock still isn't cheap. SECTOR: [PASS] Wessanen is neither a technology nor financial Company, and therefore this methodology is applicable. SALES: [PASS] The investor must select companies of "adequate size". This includes companies with annual sales greater than €260 million. Wessanen's sales of €625 million, based on 2017 sales, pass this test. CURRENT RATIO: [FAIL] The current ratio must be greater than or equal to 2. Companies that meet this criterion are typically financially secure and defensive. Wessanen's current ratio €211m/€163m of 1.3 fails the test. LONG-TERM DEBT IN RELATION TO NET CURRENT ASSETS: [FAIL] For industrial companies, long-term debt must not exceed net current assets (current assets minus current liabilities). Companies that meet this criterion display one of the attributes of a financially secure organization. The long-term debt for Wessanen is EUR 84 million, while the net current assets are €48 million. Wessanen fails this test. LONG-TERM EPS GROWTH: [FAIL] Companies must increase their EPS by at least 30% over a ten-year period and EPS must not have been negative for any year within the last 5 years. Companies with this type of growth tend to be financially secure and have proven themselves over time. Wessanen recently lost money and fails this test. Earnings Yield: [FAIL] The Earnings/Price (inverse P/E) %, based on the lesser of the current Earnings Yield or the Yield using average earnings over the last 3 fiscal years, must be "acceptable", which this methodology states is greater than 6,5%. Stocks with higher earnings yields are more defensive by nature. Wessanen's E/P of 4% (using the current Earnings) fails this test. Dividend: Wessanen paid a dividend of €0,13, which resulted in a 1% dividend yield. 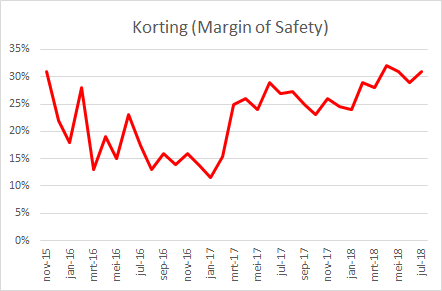 At the same time the company sold shares: They took money from shareholders (maybe not a bad idea if the share price is very high compared to intrinsic value). 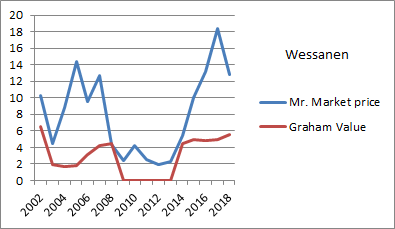 Conclusion: Not a stock for the Graham Defensive Investor. Maybe a buy under 8 EUR. Share for the coming year are estimated at $2,84/share. The company pays a dividend of $1 per year / $38 price per share = 3% dividend yield. Very strong balance sheet, company won't go broke anytime soon. AGX is neither a technology nor financial Company, and therefore this methodology is applicable. The investor must select companies of "adequate size". This includes companies with annual sales greater than $1 billion. AGX's sales of $803.7 million, based on trailing 12 month sales, fail this test. The current ratio must be greater than or equal to 2. Companies that meet this criterion are typically financially secure and defensive. AGX's current ratio of 2.82 passes the test. For industrial companies, long-term debt must not exceed net current assets (current assets minus current liabilities). Companies that meet this criterion display one of the attributes of a financially secure organization. The long-term debt for AGX is $0.0 million, while the net current assets are $300.3 million. AGX passes this test. Companies must increase their EPS by at least 30% over a ten-year period and EPS must not have been negative for any year within the last 10 years. Companies with this type of growth tend to be financially secure and have proven themselves over time. AGX's EPS growth over that period of 948.6% passes the EPS growth test. The Price/Earnings (P/E) ratio, based on the greater of the current PE or the PE using average earnings over the last 3 fiscal years, must be "moderate", which this methodology states is not greater than 15. Stocks with moderate P/Es are more defensive by nature. AGX's P/E of 11.02 (using the current PE) passes this test. The Price/Book ratio must also be reasonable. That is, the Price/Book multiplied by P/E cannot be greater than 22. AGX's Price/Book ratio is 1.68, while the P/E is 11.02. AGX passes the Price/Book test. 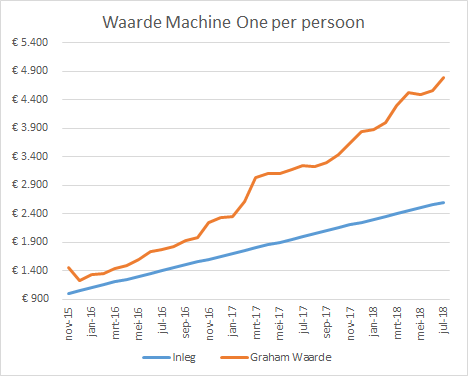 Ik (Ansgar John) heb een fout gemaakt en heb teveel aandelen gekocht in verhouding tot de "value averaging" plan. Excuus. We hebben per Machinist nu 7 Euro cash, dat zou ongeveer 47 Euro cash moeten zijn. Ik heb een paar limiet orders geplaatst om wat te verkopen om zo geld te hebben om te kunnen profiteren van een mogelijk crash in de nabije toekomst. We hebben besloten (PC) Connection helemaal te verkopen. Martyn Top zal blijven kijken naar een mogelijk nieuwe lage instap moment voor (PC) Connection, ticker CNXN. 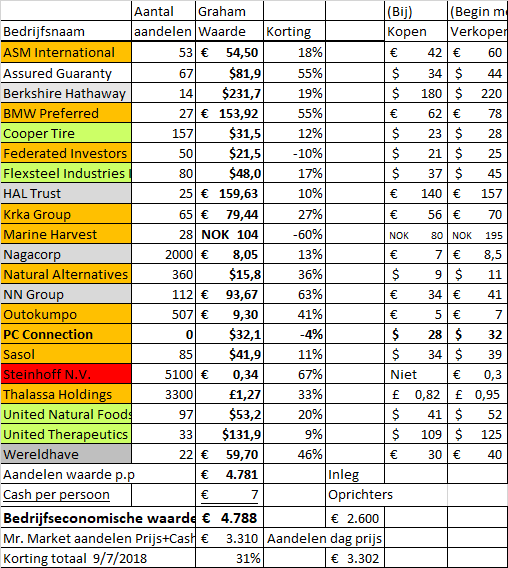 Hij gaat ook United Natural Foods ticker UNFI voor zijn rekening nemen? We hebben BMW Preferred ticker BMW3 aandelen bijgekocht na eerdere verkoop op veel hogere niveaus. Het effect van Tesla en de handelsoorlog met de VS is voor mij moeilijk in te schatten. BMW lijkt wel te begrijpen dat ze electrische autos zullen moeten gaan bouwen. Op de kaft van de Jaarverslag 2017 stond: "The Future is Electric" Ook ASM International chips hebben we bijgekocht. Dank aan Carolien v/d Wal voor het toevoegen van de kleuren codes in de "Begroot Aankopen" overzicht en Holdings hieronder.